Venus Express was launched from the Baikonur Cosmodrome in Kazakhstan on 9 November 2005. A Soyuz-Fregat rocket carried it into space and placed the spacecraft in its transfer orbit to Venus. After an interplanetary cruise that lasted 5 months, Venus Express arrived at Venus on 11 April 2006. A 50 minute engine burn slowed down the spacecraft and allowed it to enter orbit around the planet. The first capture orbit was an eccentric polar orbit and lasted 9 days. Several manoeuvres over the period 15 April - 6 May 2006 then lowered the spacecraft into its operational orbit: a 24-hour elliptical, quasi-polar orbit. At its closest, Venus Express reaches an altitude of 250 kilometres and at its furthest, it is 66 000 kilometres away from the planet. After launch and separation from the last of the four launcher stages, Venus Express spent 153 days in an interplanetary transfer orbit. After the spacecraft acquired Sun pointing and deployed its solar arrays some 2 hours after launch, spacecraft commissioning started, followed by payload health checks. No routine science operations were planned during the cruise phase. During the cruise to Venus, the spacecraft was contacted daily for health checks and navigation using the High Gain Antenna. The spacecraft was put on an arrival trajectory to Venus with mid-course navigation and a final course adjustment was performed on 29 March to fine tune the arrival hyperbola for Venus Orbit Insertion (VOI). The planning of the interplanetary transfer took into account the forces acting on the spacecraft due to the gravitational fields of the Sun, the Earth, the Moon, Venus, Mars, Saturn and Jupiter and the effects of solar radiation pressure. 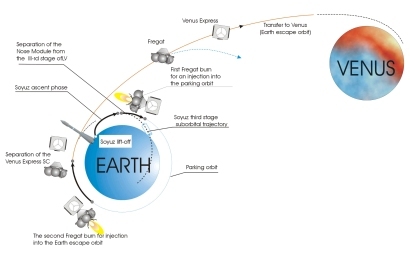 The Venus Express Orbit Insertion (VOI) manoeuvre took place on 11 April 2006. To enable capture of the spacecraft, it was first slewed such that the main engine was aligned to the direction of travel. The main engine burn lasted around 50 minutes and decelerated the spacecraft by approximately 1251 ms-1 (~ 4500 kmh-1). The spacecraft intially entered a highly elliptical polar orbit with a pericentre of 400 km, an apocentre of 350 000 km and a period of 9 days. The selected operational orbit is inertially fixed, so that coverage of all planetocentric longitudes can be accomplished in one Venus sidereal day (243 Earth days). The nominal mission orbital lifetime was two Venus sidereal days (roughly 500 Earth days). Following the approval of a mission extension in February 2007, Venus Express operations will now continue till early May 2009, by which time Venus Express observations will have been performed for more than four Venus sidereal days. The first Venusian day of the mission was devoted to global latitude, longitude, and local time coverage of the planet. The second day provides opportunities for filling observation gaps experienced during the first day, for studying in more detail objectives selected on the basis of the first day's observations, and for investigating the time variability of previously observed phenomena. The Venus Express mission aims at exploring the Venusian atmosphere, the plasma environment and the surface characteristics of Venus from orbit. A high inclination elliptical orbit provides complete latitudinal coverage and gives the best compromise for allowing high-resolution observations near pericentre, global observations during the apoapse part of the orbit, and measurements of the Venusian plasma environment and its interaction with the solar wind. With the fixed size of the fuel tanks on the spacecraft, the choice of possible orbits was limited. After studying several options, the final elliptical polar orbit was selected.